Plate thirteen from 'Picturesque Scenery in the Kingdom of Mysore' by James Hunter (d.1792). This aquatint is based on a picture by Hunter. 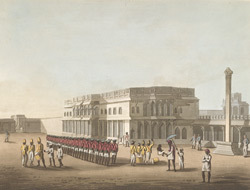 It shows the north entrance to Tipu Sultan's palace (built in 1791) in Bangalore with a line of sepoy soldiers in front of the palace building. Tipu Sultan (1753 -1799) campaigned against the British during the Third and Fourth Anglo-Mysore Wars in the late 18th Century. The palace (1791) took ten years to build and was used as a summer retreat.